This week's Production Weekly reveals that Dwayne 'The Rock' Johnson has signed on to work with Disney for the third time in three years. The report gives some juicy details on the development of Walt Disney Pictures "20,000 Leagues Under the Sea: Captain Nemo." Here's the breakdown: "20,000 Leagues Under the Sea: Captain Nemo," is in active development. The script was penned by Justin Marks and Bill Marsilli. McG is directing the film and it will be shot on location in Australia. Disney has fast-tracked the project and hopes to finish the film by the end of the year for a 2010 release. Lastly, but definately not least, Dwayne 'The Rock' Johnson has been cast in the feature film. The film is describe as the following: A fugitive whaler teams up with a naturalist, a mysterious woman and a captain of a futuristic submarine, to search for a lost underwater civilization that holds libraries of vast knowledge and a weapon with the power to destroy mankind. No word on whether Dwayne Johnson will be playing Captain Nemo or the fugitive whaler, but money says Nemo. Johnson's work with Disney has been his biggest grossing films, so it wouldn't be far fetched to think Disney gave him the title role. Not so sure of the idea on the contrary, Johnson is better fit as the muscle and comic relief in a film, rather than a scientific genius piloting the Nautilus. 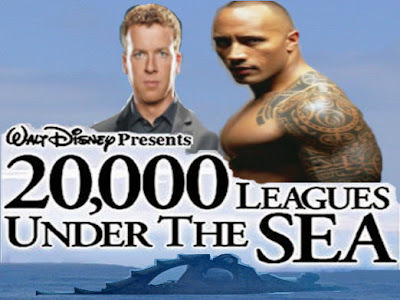 With potentialy 'the Rock' in the title role, I could see "20,000 Leagues Under the Sea" quickly turning too family-friendly. So does this rule out Will Smith in the film as well? At this point it looks as though Disney may have optioned for Johnson over Smith, who could have had a large price tag. Although, it doesn't necessarily mean that Smith won't also be cast in the film. With both Dwanye Johnson and Will Smith onboard "20,000 Leagues Under the Sea: Captain Nemo" would be an instant box office success and worth the cost of Will Smith.